Instance type picker. Filter on the type of instance: Trial, Production, Sandbox. Common Data Service instance. PowerApps Environments provisioned with Common Data Service in the PowerApps admin center are now displayed in the Dynamics 365 admin center as Common Data Service instances. If you're a large organization, you might have numerous instances of various types such as Production and Sandbox. You can now filter for instance type to show only the type you're interested in. Select an instance type to display instances for that type only. 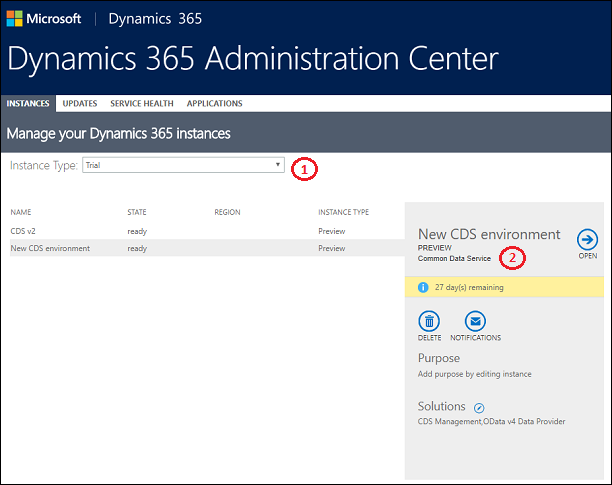 Once you create Environments provisioned with Common Data Services in the PowerApps admin center, they will now show up as Common Data Service instances in your Dynamics 365 admin center. 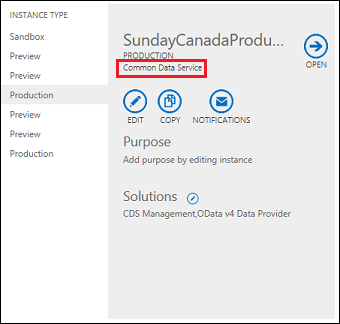 For more information, see Manage Common Data Service instances.